Long time no hear! Thank you for sending in your feedback regarding compatibility issues with Windows 10 - we're aware of them. An update will follow. Also, we've removed OpenCandy (displayed an ad during the installation process) from the Dexpot installer. We're back online from a severe server downtime. If you don't receive an answer to your inquiry within the next few days, please re-send your email. Sorry! Wishing you all a Happy New Year 2015! Our purchase order form now complies with the EU Mini One-Stop Shop scheme. Prices stay the same. Hello, balloon tips in Taskbar Pager: Grab your copy of Dexpot 1.6.14 Build 2439. Some important bugfixes with Dexpot 1.6.13 Build 2429. Available now. No April Fools' joke: Dexpot 1.6.12 Build 2416 is here and comes with great additions to DexControl. Thank you for your suggestions that made their way into Dexpot 1.6.11 Build 2394. Several bugfixes included. Merry Christmas and a happy new year! An update will follow shortly. Numerous side effects over UIAccess. Thus: Get out! Dexpot 1.6.10 Build 2373 is available for download. Dexpot 1.6.10 Build 2369 includes a critical bug fix. Sorry for the confusion! Touch support for DexControl and the Leap Motion Controller. Dexpot 1.6.10 Build 2362 available now. We're looking forward to your feature videos and photos! Dexpot 1.6.9 Build 2285 bugfix release available now. Thanks for your reports. Some nifty new options for Dexpot 1.6.8 Build 2266 and many bugfixes. Further information available in the changelog. "Doppeldrücks" - Double tap your Ctrl or Shift key to launch Full-screen preview or perform other actions. See the changelog for more info on what's new in Dexpot 1.6.7 Build 2249. Alaaf and Helau (Typical German, Rheinisch carnival dictum)! Dexpot 1.6.6 Build 2227 is ready. Stop catching "Kamelle", download and try out. Wishing you a Happy New Year with a maintenance release: Dexpot 1.6.5 Build 2207 is here. Trick or treat! Dexpot 1.6.4 Build 2186 is here: New Dexgrid hotkeys, many bugfixes and compatibility improvements. Thanks again for your feedback and support - Happy Halloween! Dynamic Taskbar Reordering for Windows 8, gathering windows by hotkey, a new Hot Corner action for minimizing all windows, and loading tray icon sets via 'Settings > Appearance': Dexpot 1.6.3 Build 2167 is available for download. Windows 8 support, increased readability of both systray and SevenDex icons and an auto start option for Desktop Slideshow. Dexpot 1.6.2 Build 2143 is now available. Thank you for your feedback. A small bugfix update is now available for download and through the Dexpot Updater. We're pleased to announce that Dexpot 1.6 Build 2116 is available for download today after 3 years of development. Dexpot 1.5.18 Build 2098 is now available. This last build of Dexpot 1.5 accepts 1.6 Pro license keys. Pre-order Dexpot 1.6 now and use the Release Candidate until Dexpot 1.6 Final will be released on July 16th 2012. Dexpot 1.6 Beta Build 2003 is available for download now and comes with a completely redesigned Desktop Manager and Desktop Preview as well as some improvements to DexControl. Dexpot 1.5.17 Build 1991 fixes the double-click action for the additional button in the Desktop Manager. Bugfixes, bugfixes, bugfixes! Dexpot 1.5.17 comes with many improvements. Hello, Serbian users: There are now Cyrillic and Latin language files. The update is recommended for all users. Dexpot 1.6 Beta Build 1928 is now available for download and through the Dexpot Updater, along with DexControl - Virtual desktops simplified. Dexpot 1.6 Beta Build 1858 is now available for download and through the Dexpot Updater. Download Dexpot 1.5.16 Build 1853 or update via the Dexpot Updater. Fixes some critical issue. Download Dexpot 1.6 Beta Build 1805 "Indefatigable Ivy" now! Dexpot 1.5.15 Build 1799 is now available for download and through the Dexpot Updater. Comes with a great new feature: regular expressions for Desktop Rules. Dexpot 1.5.14 Build 1777 and Dexpot 1.6 Beta Build 1776. Both versions are now available for download and through the Dexpot Updater. Dexpot 1.6 Beta Build 1737 is now available for download and through the Dexpot Updater. Virtual desktops are supplemental work spaces for windows and icons in Windows. You can switch virtual desktops at a keystroke or with your mouse. What's the use of virtual desktops? Free for private use ? Ten years' worth of effort really shows. Dexpot is polished and nearly bug-free. Dexpot makes virtual desktops feel like a native part of Windows. If you don't have Dexpot yet, the new update makes it a must-have tool for Windows, adding a ton of features to your desktop that you never knew you wanted. Dexpot has always been a great program, but with this new version it is a must for every Windows user struggling with window management. Simply put, this is a very powerful virtual desktop software solution. Highly recommended. If you're a Linux user, there's a good chance you can't live without virtual desktops. They're a great way to organize your workspace. 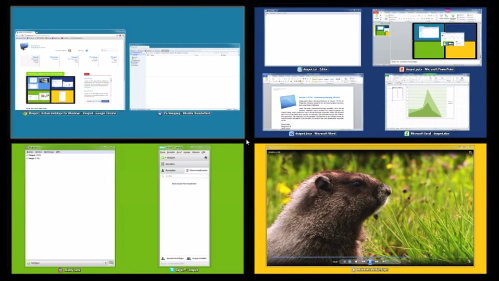 Dexpot brings virtual desktops to Windows, complete with 3D effects and extensive customizability. Using multiple Windows desktops with Dexpot will make your life so much easier, you'll wonder why you didn't give it a try sooner. Dexpot rocks not only because it's absolutely gratis for personal use, but also because it's packed with UI hints to remind you about your virtual desktops, and it's extremely customizable. If you can’t wait for Windows 10 to finally introduce virtual desktops once the casual users have left the power user building, be sure to check out the superb Dexpot. It’s free, and it rocks.